help victims of natural disasters around the world. storms and have some fun doing it! Do you know someone who is afraid of thunderstorms, tornadoes or hurricanes? Do you want to get your family or students ready for severe weather in a fun, non-threatening way? 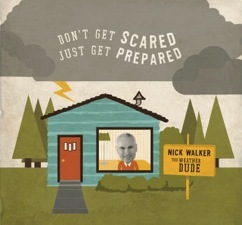 In popular musical styles ranging from pop to blues and salsa to surf, Nick gives young people the information they need to feel safe in any kind of severe storm. Ten catchy songs with activities to teach kids the basics of weather! 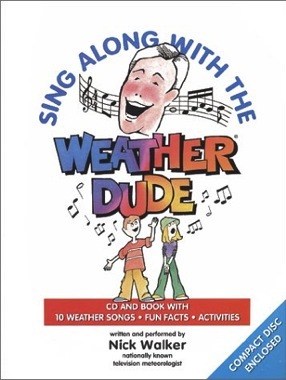 In a fully-produced recording, Nick Walker, on-camera meteorologist for The Weather Channel® makes complicated concepts simple, singing ten fun original songs, each one an entertaining mini-lesson in meteorology. In styles ranging from light rock to light rap to ballads, Walker guides children through cloud types, rain, snow, wind and air pressure, thunderstorms, the seasons, the water cycle & forecasting. Do you want your books or CDs autographed? Indicate in "Special Instructions" box on checkout if you would like them autographed and to whom. Orders from countries other than the U.S. and Canada are not available from this site. If you need to ship to another country, please order through Amazon.com or download the songs using the links to the right.